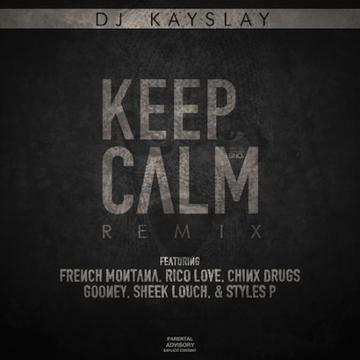 DJ Kay Slay brings out his feature-heavy remix to "Keep Calm," with French Montana, Rico Love, Chinx, Gooney, Sheek Louch and Styles P on the track. DJ Kay Slay knows how to bring out the guests on a remix. That's right,Â French Montana, Rico Love, Chinx, Gooney, Sheek Louch *and* Styles P all make appearances for this star-studded mix. When you're done with this track, head over to the page with his latest mix,Â The Rise Of A CityÂ for more DJ Kay Slay, erm, good-ness?